Here, the best things to drink with fried chicken, shrimp and grits, and more classic Southern dishes. In today's Chefs in Conversation video, Hugh Acheson and Marcus Samuelsson reveal the secrets to perfect fried chicken—from what kind of chicken to buy to the oil temperature. But they left out one thing: What to drink with it. Here, the best things to drink with fried chicken, shrimp and grits, and more classic Southern dishes. Pairing: There are a ton of options for fried chicken, but the best pairing is something fizzy to cut through the buttery, crispy coating. Try a minerally brut Champagne. Pairing: Sauvignon Blanc’s tangy flavors are great with tart green tomatoes. Pairing: Match the rich and sweet barbecue sauce with a juicy, berry-rich Zinfandel. Pairing: Spicy, coffee-scented Argentinian Syrah will enhance the flavors in the gravy. Pairing: Crisp pale ale that has a good balance of malt and hops is perfect with crispy hush puppies. Pairing: Rich cheese grits need a wine with some substance, but one that isn’t so tannic and massive that it will overwhelm the sweet shrimp—in other words, Pinot Noir. Pairing: Smoky, ripe Santa Barbara Syrah is delicious with a tangy, vinegar-based barbecue sauce. Pairing: The somewhat vegetal flavors of Sauvignon Blanc are right at home with spicy Jambalaya—especially a full-bodied bottle from the US. 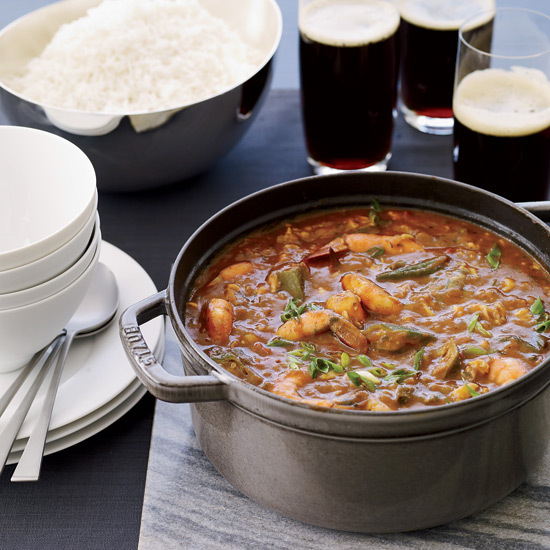 Pairing: Drink like a local when eating gumbo. Try a full-flavored beer like Abita’s Turbodog. Pairing: The crispy fried fish sandwiches are terrific with a zippy Pinot Grigio. Pairing: A fragrant, full-bodied California white like a Chardonnay or a blend will complete this comforting meal.